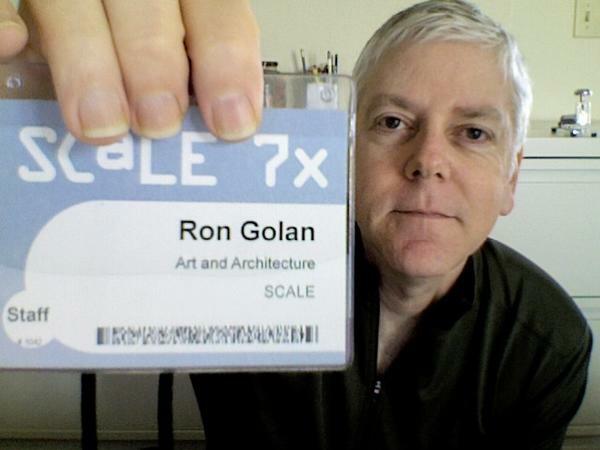 Ron Golan, architect by day, SCaLE planner by night. Ron was kind enough to take some time out of his day to answer a few questions and give us a glimpse into SCaLE from the expo floor up. Ron Golan: I've worked on every SCALE since the beginning. At first I was only doing the expo floor layout. A couple of years later I saw that the signage was just generic stuff provided by the furniture contractor so I offered to do that also. Now I'm doing those things and the SCALE branding, logos and other graphics, t-shirts, badges, programs, advertisements both in print and on the web and few other odd jobs that come up. RG: I'm an architect, the kind that designs buildings. That's why I started out with the expo floor layouts. AG: How did you get involved in FOSS? What was your first Open Source distribution and when? What do you use now and why? RG: I had an architectural firm that was 100% Macintosh. We were working on a project and files were getting a little large. We had what was called a LocalTalk network with no file server, just shared folders on the Macs. That network basically ground to a halt so I decided we needed a file server and ethernet network. I went into a local computer bookstore and started looking at the Mac networking books. Someone approached me, he sounded like he recently immigrated from Russia, and asked me what I was trying to do. I told him about the Mac network and he took me to the Linux section and handed me a copy of Running Linux and a Red Hat 5.0 boxed set and told me to read the book. With a friend's help, I built an x86 machine. I installed Linux on it and have been using it ever since. That was in 1997. About a year or two later I switched to Debian. I think it was Slink. Now I use Debian on servers and Ubuntu on desktops. AG: What are some of the challenges you face when planning SCaLE and how do you over come them? RG: For me, the biggest challenge is getting all the design and production artwork done in time. With the current schedule, my workload gets compressed because much of it is dependent on submissions from speakers, sponsors and exhibitors and that stuff doesn't get to me until pretty late in the cycle. One area that I think SCALE could use help is writing our ads. A creative ad person would be welcome. RG: I think what we are doing is fostering a steady and sustainable growth. There might have been some slowdown in the growth curve recently but I expect that to pick up and continue for many years. I'm more interested it providing quality than quantity. I think that's what has kept SCALE going strong since it started. RG: I feel very fortunate to be able to contribute to SCALE. It's hard work but each year when I see that the attendees are really excited to be there, I'm reminded how the work of all the SCALE organizers and volunteers is important to the community. We each contribute what we can and that's what a community is all about. Ron, again thank you so much for taking a few moments to let us get to know a little about you and the Southern California Linux Expo - SCaLE. If you haven't made up your mind about attending SCaLE 8x this year take a moment to check out the website and make plans to attend - hope to see you there.